Since the end of the Cold War, conflict prevention and resolution, peacekeeping and peacebuilding have risen to the top of the international agenda. The fourth edition of this hugely popular text explains the key concepts, charts the development of the field, evaluates successes and failures, and assesses the main current challenges and debates in the second decade of the twenty-first century. In response to ongoing changes in the dynamics of global conflict, including the events and consequences of the Arab revolutions, the rise of the self-styled 'Islamic State', the conflict in Ukraine, and the continued evolution of conflict resolution theory and practice, this edition provides a fresh assessment of the contemporary conflict landscape. Comprehensively updated and illustrated with new case studies, the book identifies a new pattern of 'transnational conflicts' and argues for a response based on cosmopolitan conflict resolution, defined as the promotion of the cosmopolitan values on which the welfare and life hopes of future generations depend. Part I offers a comprehensive survey of the theory and practice of conflict resolution. Part II sets the field within the context of rapid global change and addresses the controversies that have surrounded conflict resolution as it has entered the mainstream. 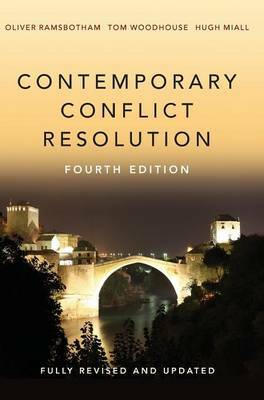 Contemporary Conflict Resolution is essential reading for students of peace and security studies, conflict management and international politics, as well as for those working in non-governmental organizations and think-tanks.